Brief: Appraisal, option development and conversion to provide seminar and social space within a category A listed building. Following the closure of the ‘Heatherington Club’ which was used by post-graduate students at the University as a social space, ECD Architects was asked to design a new post graduate social space within the Grade A listed Gilbert Scott main building. The space which was allocated was the University telephone exchange on the ground floor which had previously been the library of the original building. The new social space serves several purposes. It incorporates a quiet study area where small work groups could meet with lecturers, a main social space for use as a cafe during the day and bar at night, and a lecture theatre for talks, exhibitions and private functions. The primary design consideration in the space was the stone structural internal columns. It was decided that the columns would be integrated into the two main elements of the design – the bar and the lecture theatre. In the lecture theatre the columns were incorporated into a thick ‘storage wall’ used to store away chairs when the room was being used for exhibitions. In the main cafe space the bar storage wraps around the column to create an informal column barrier between the bar and the more quiet study space to the rear of the facility. 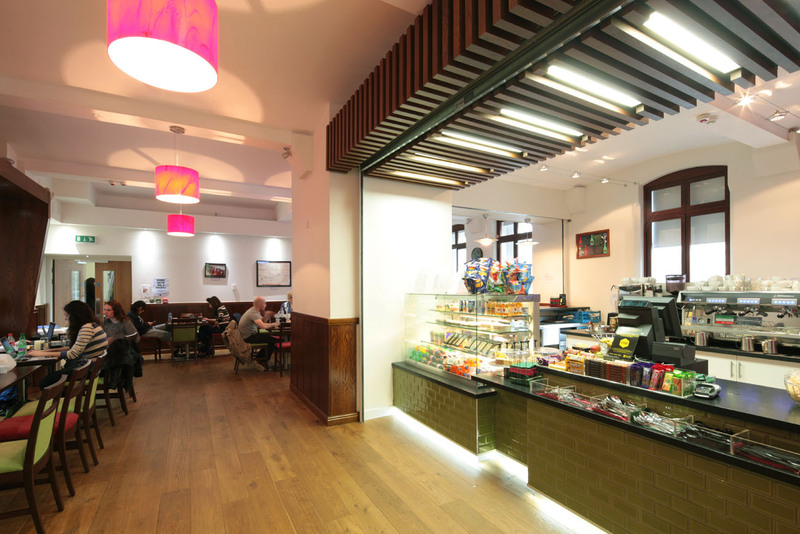 This separation was further reinforced by the use of a lowered timber slatted ceiling to create a passageway through which patrons moved between the spaces. 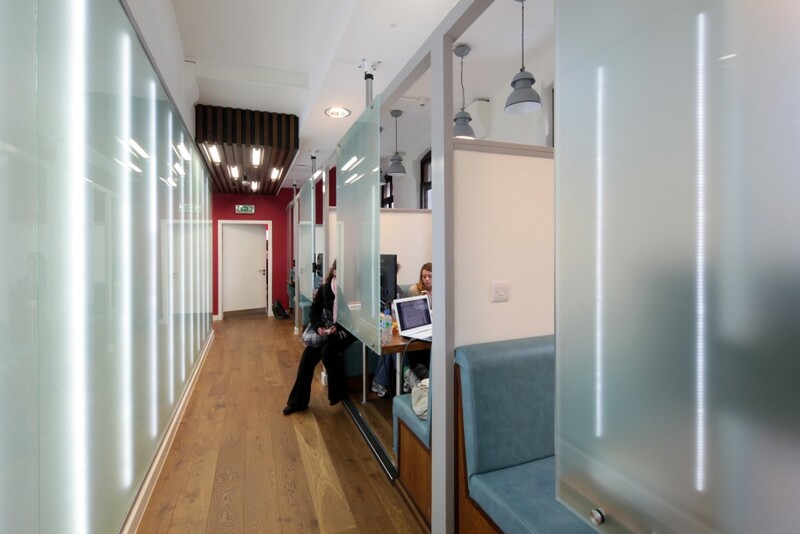 The study spaces were designed as booth seats with frosted glass panels to provide privacy whilst allowing natural light back into the passageway. Monitors were incorporated into the glazing to facilitate group study sessions. Panelled timber, ceramic tiling and extensive feature lighting was then utilised to create a homely atmosphere.